Choose Fix-a-Frame for jersey framing Brisbane. Jersey frames, memorabilia shadowbox framing and custom made frames to fit jerseys. Buy frames for your jersey today. Jersey framing specialists and experts at framing jerseys. The craft of professional jersey framing in high-quality custom frames is a difficult one. It is a very intensive process that requires skillful and precise ironing and pinning of the jersey. In particular, the pinning must be done carefully using specially designed stainless steel framing pins that not only will secure the jersey to the matting but will also not damage the jersey in any way. We also use stitches to hold the jerseys securely to the backing boards. In some examples the sleeves can be folded to show the sponsors names and logos. The backing boards are acid-free and designed not to harm the fabric in any way. The outer mats can be customised with logos and cut-outs to show team photos and other memorabilia items. Team members names can be printed onto the matting or set into design boxes. The presentation of your jersey is can be uniquely designed so that you have a one-of-a-kind jersey frame. Extra protection is provided with the addition of Conservation glass that filters UV light helping to protect the colours from fading. This is of particular importance when the shirt has signatures on it. For a truly stunning look you can use Museum Glass that not only protects against fading but is also anti-reflective and practically invisible. When you visit the store these conservation considerations can be fully explained to you and you will be able to see examples of their special characteristics. Watch how we framed a jersey in the video below. Our framers have years of memorabilia framing experience, framing for corporations, athletes and professional teams. As such we have mastered the craft of creating custom box framing solutions for any kind of shirt, jersey, collectible or object. Creating tasteful and unique shadowbox framing is a skill acquired over many years. The box frames can be lined with a variety of coloured suedes or fabrics to match the backing boards or the memorabilia. These liners or spacers are precision cut with out computerised mat cutting machinery which gives a precise and detailed quality to the shadowbox frame. You can read about the damage caused to a Brisbane Bronco's jersey that was framed back in the early nineties in an article here. Have a look at a shadowbox frame we made to fit three wooden figurines. At Fix-a-Frame, we choose premium materials for our custom frames and custom display cases. We only use high-quality frames, matting and mouldings, and acid-free archival backing. Available options include beautiful selections of framing, special UV-protective glass, suede and colour-matched matting, and engraved plaques. All our jersey frames are custom made to suit the style of jersey framing you desire. Our team of designers will work with you to enhance and protect your jerseys. 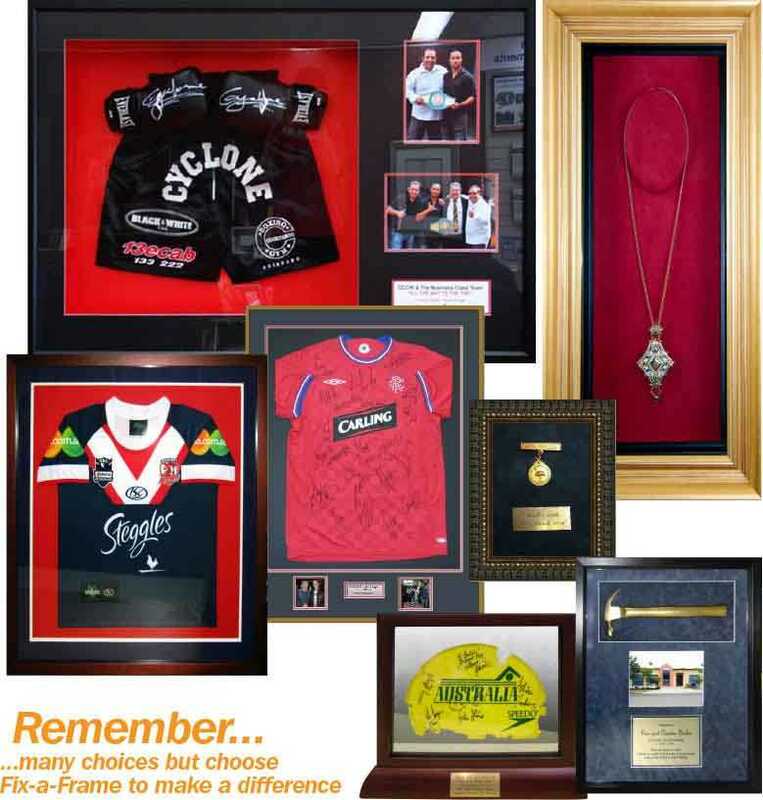 Our sporting memorabilia framing doesn't just stop with jerseys. We have framed a wide variety of other items like footballs, caps, jackets, medals, shoes, swimsuits, olympic torches, to name a few. No items are too complex for us to build a frame to display them. Browse our gallery pages to see some of the other objects we have framed. We are pleased to be able to offer this quality framing to you at very competitive prices. If you have a special jersey or piece of sports memorabilia that you would like to frame, please let us help you proudly display and protect your collectible. Start improving your collection today. For jersey framing that will make your friends go "WOW!" choose Fix-a-Frame to make a difference.